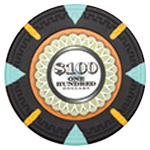 The Mint Poker Chip was named to represent the house or bank. Because the U.S. Mint is where the government coins money, a “Mint” chip seemed appropriate. In essence, the name was designed to reflect a “Beat the bank” mentality. 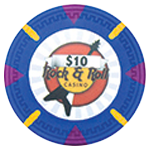 After all, to some, poker chips are synonymous with Las Vegas. And many people go to Las Vegas with the hopes of winning large sums of money to gain wealth and notoriety. And what better way to try to attain that goal than high-dollar poker games? From 1958-1966 there was a casino in Las Vegas known as The Mint. Its name was later changed, and from 1966-1989 it was known as the Del Webb Mint. 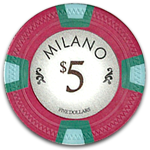 When the casino changed names, it began using a spiral or scallop inlay for the in-house chip design. This innovative feature broke away from the traditional circular patterns that were being used at many other casinos during that time. It was this unique design that gave us the inspiration and impression for our “Mint” poker chip. 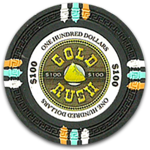 But if you want real high-dollar poker chips to supplement your home game, The Mint Chip is the answer. The Mint is available in the following denominations: 5¢, 50¢, $1, $5, $10, $25, $50, $100, $500, $1000, $5000, $10,000. It doesn’t matter if you are hosting a large poker tournament with hundreds of thousands in tournament chip value or if you are playing a 25¢ – 50¢ limit game. This poker set will surely heighten your gaming experience. When choosing the mold for the Mint, we relied heavily on, and were inspired by, past poker chip molds such as the Rectangle mold and the Zig Zag mold. In fact, the Rectangle mold used 19 rectangles around the edge of each chip. This mold was at its height in popularity in the 1950s and primarily found in smaller, now-closed Las Vegas casinos like the Rendezvous and the Luigis Broiler. Both molds, Rectangular and Zig Zag, said a lot about old Las Vegas poker chip styles, which was “More class and less flash.” Thus, the Gear Wheel mold fits this mantra. Because money was the main focal point for this chip, The Mint inlay uses a very clean and regal design that prominently features the denomination in the center of the chip, along with a dollar sign. The edge spots on The Mint chip are known as triangle and stick. We combined two unusual styles to arrive with this edge spot. We found that some old-time casinos, such as the Apache, used a double triangle edge spot in the early 1930s and 40s. Using a triangle edge spot was a way to differentiate our chips from the rectangular mainstay. 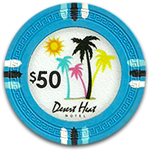 The one other example we found of a triangle and stick edge spot was on a $1,000 poker chip from what used to be The Sands Hotel and Casino. This particular casino was in business from 1952 to 1996. Sadly the historic casino was demolished because of its inability to compete with newer, more modern amenities being built on the Las Vegas Strip. Prior to its demolition, The Sands was used as a venue to film scenes from the widely popular movie “Con Air” staring Nicholas Cage. Today, The Venetian is located where The Sands used to be. The mold we used for The Mint chips is a Gear Wheel, which provides an impression that looks like the teeth of a grinding gear wheel. 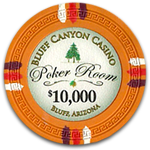 The consistent nature of the mold markings and many right angles provides a gritty surface on the face of each poker chip.